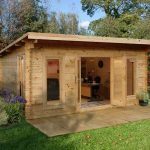 There aren’t many garden features that can look as attractive as a high quality, well built log cabin, and that’s just what we found here. 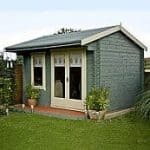 Despite its roomy and welcoming interior, it has a compact hexagonal design which means that it’s easy to fit into the corner of a garden of almost any size. With the installation of furniture and entertainment systems this can quickly become your favourite part of the house, and the key operated cylinder lock keeps all the contents safe. Safety from the elements is also an important consideration, so we were pleased to see how effective the roof and cladding were at keeping rainwater out. The apex style roof simply channels water harmlessly away, whilst the logs lock together tightly meaning that there’s no way through for water and moisture. To keep up its weather defences, however, regular wood preserver treatments will need to be applied by the owner. Once inside the log cabin, it’s surprising just how bright and airy it is. That’s thanks to the large double glazed windows, and it was good to see that they are fully opening to enable ventilation when required. The double doors too are fully glazed, so the interior is bathed with light on sunny days. 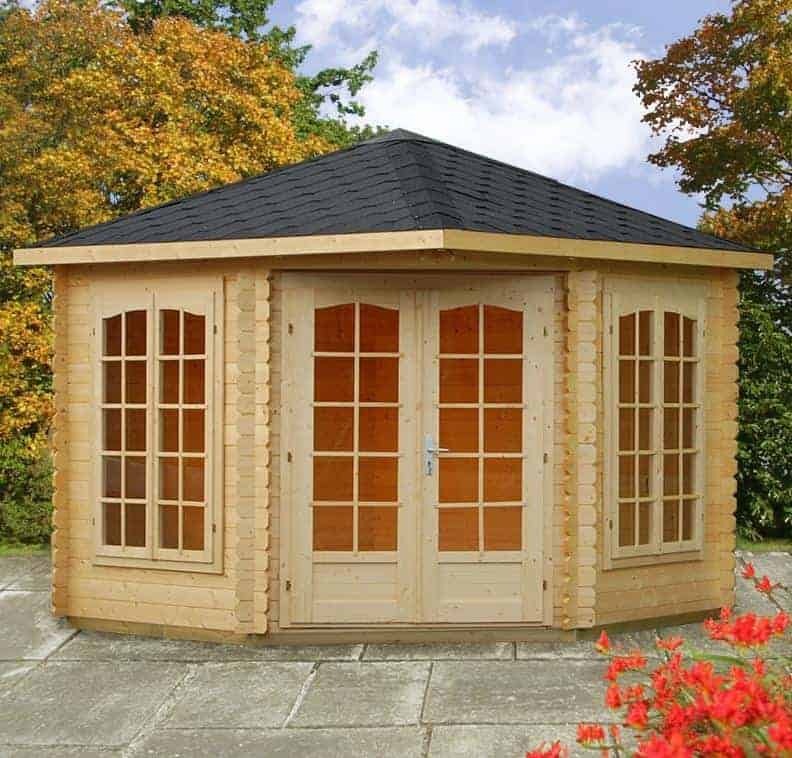 This apex roofed log cabin looks as if it could have come straight from a timeless Alpine scene, and yet we feel it would make a highly attractive addition to any British garden as well. Whilst having a many sided design it’s based upon a square base size, so can easily fit into any corner. It’s supplied unpainted, and so you can make it even more decorative by painting it in a colour scheme of your choice. One of the first things we noticed about this cabin is just how tall it is, which is thanks to the felt covered tongue and groove apex roof. It has a ridge height of 2.85m, which is well over nine feet, and an eaves height of 2.17m. The overall width and depth of the cabin are both 2.80m, although these become 3.22 when the overhang is taken into account. We were very pleased to see that 28mm thick interlocking cladding had been used as this gives excellent strength and stability, even in windy conditions. Chalet connectors on the corners add to this stability, and also to the already impressive aesthetic appeal. Part of this appeal is thanks to the light colouration of the Nordic Spruce timbers, and this is a wood renowned for its toughness when used in construction. We were also impressed with the floor, which is made of tongue and groove that has a thickness of 19mm. What we liked most about it was that it comes with integrated pressure treated floor joists. By raising the floor itself above ground level, the threat of rot being caused by ground moisture is greatly reduced. Whilst the threat of rot from the ground has been negated, there’s a very real threat elsewhere. This is because no initial preservative treatment has been used by the manufacturer, something that we were both surprised and disappointed at. Timbers can be especially vulnerable to moisture in their early days, so it’s imperative that the owner adds their own coat of wood preserver as soon as possible. This will then need to be reapplied every year, so be aware of the extra time and money that this could involve. The lack of an effective pre-treatment is also likely to be the driving factor behind the lack of an extended warranty against rot. We were pleased, however, to see that a five year structural guarantee has been provided. One of the first things that strikes a person walking into this log cabin is just how bright and roomy it is. That’s because there’s a profusion of glass, from both the fully glazed double doors and two large windows. The windows can be opened too to allow fresh air in, so this is a very pleasant environment to pass the hours in. The double doors themselves are both taller and wider than many that we see, with a width of 1.34m and a height of 1.81m. 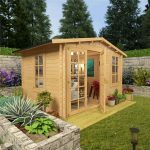 We feel this is particularly important in a log cabin, where most people will want to bring large and bulky objects such as furniture through the doors. We were pleased to see that double glazing had been used for the windows, as it not only creates an interior that’s both warmer and quieter, it means that they are much tougher and more impact resistant. Whilst this is one useful security feature, the one we welcomed most of all was the cylinder lock. Operated by a key, it means that the door to your log cabin can be just as secure as the door to your house. 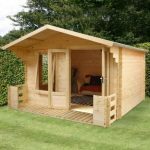 We do like to see customisation options available to the customer so it was a pity that there are none offered here, but this in itself is a tribute to just how much is included as standard with this log cabin. One thing that does need to be purchased, of course, is a high quality wood preserver, but this will need to be sourced and purchased separately by the customer. We were impressed by the high quality components used throughout this log cabin. From the chalet connectors to the double glazed windows, it was obvious that no corners had been cut here. 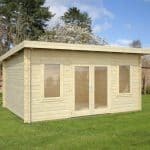 Unfortunately we were less impressed by the lack of any treatment of any kind by the manufacturer, placing the emphasis on the customer treating the log cabin to give it protection against rot. Whilst we have reviewed much larger log cabins, this is still very accommodating thanks to its tall apex roof. We were glad to see that this cabin has a modular design, as this makes it easy to fit together despite its size. With a team of two, installation can be completed in as little as two hours. 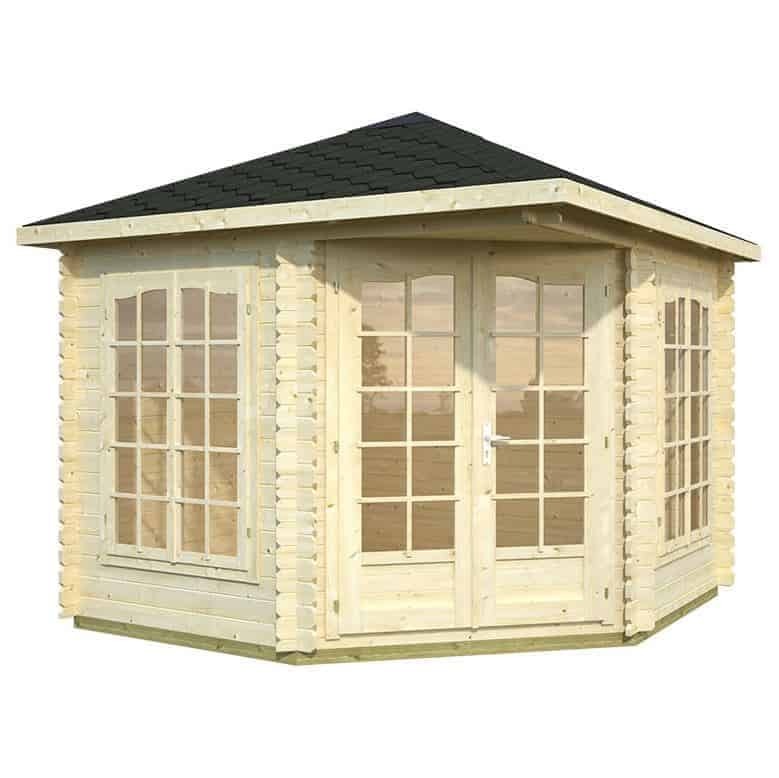 Even though this is a very attractive log cabin with lots of features, the lack of an extended warranty and its high price tag have to be taken into consideration. Final Thoughts: We found a lot to like about this log cabin, not least of which was its very attractive appearance. 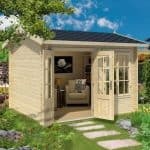 It’s a garden building that you’ll be proud to own, and its accommodating size make it very functional as well. With the double glazed windows letting lots of light flood in, and creating a pleasantly warm atmosphere, this becomes a great place to relax on a sunny day. Thanks to the key operated lock you’ll also be able to install furniture and electrical goods inside without having to worry about their safety, so you can create an interior that’s even more homely and welcoming.